The most persistent strand running through our readers’ survey responses was alcohol, alcohol services, lack of money for alcohol. Putting all the pieces together, you get a very disjointed picture of treatment and funding. Detailed documents such as the NTA’s 205-page long effectiveness review of alcohol treatment (see page 7) give interesting and valuable research – but are the key themes finding their way into better treatment? At the very practical end of the scale, the user-led North East Regional Alcohol Forum (NERAF) is feeding into policy with the very real evidence from its members on what works. Their recent initiatives have included responding to the government’s ‘Know your limits’ campaign on binge drinking, and launching a community detox and peer-led aftercare service for alcohol clients. ‘Commissioning brief interventions in primary care settings would have a major impact on public health’. 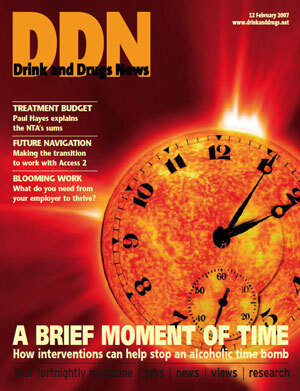 On that note, I am very pleased to welcome Alcohol Concern to our panel of DDN partners. I hope we can help to strengthen the ever-growing alcohol policy lobby, through publicising its successes and struggles, in return for the very welcome expertise they will offer our editorial. Finally, a note of sincere thanks to all of you who returned such interesting and detailed readers’ surveys.